Francie and I seem to have hit a sweet spot where our rides are more fun and relaxed. She's a forward moving horse that wants to please. She can still be a little hot at times, but she is starting to mellow a little. I ordered a new saddle pad with a couple of roomy pockets, in case we find ourselves trail riding in the future. I can easily tuck in a hoof pick, a cell phone, and a snack. 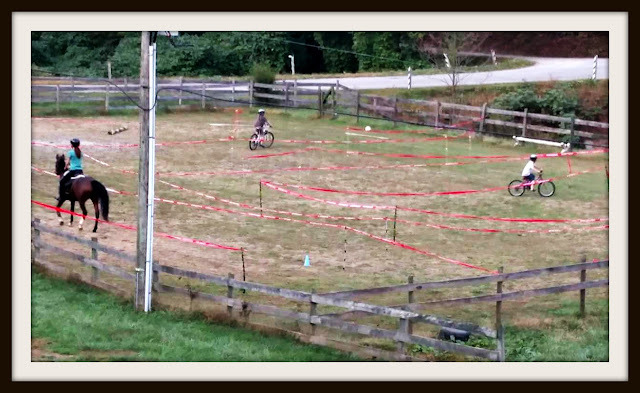 A couple of weeks ago, Paul made a cyclocross course in the riding arena. The boys had a blast riding this bike maze. 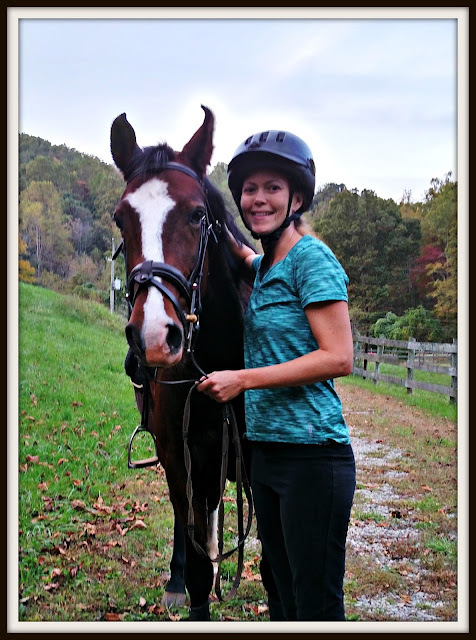 I wanted to ride Francie, but didn't know what she'd think. At first, she thought it was pretty awful. She snorted as though the red tape was going to attack her. I hand walked her through. She calmed down. Then I hand walked her through a second time, rattling the tape as we went. She was spooky at the moving, rattling tape at first, but then calmed down again. After that, I hopped on her. We walked through and then we trotted. Then she started having fun. She was enjoying whipping around the 180 degree corners! By the end, she was cantering the long stretches, trying to catch the boys on their bikes. I had no idea she would have so much fun with this. 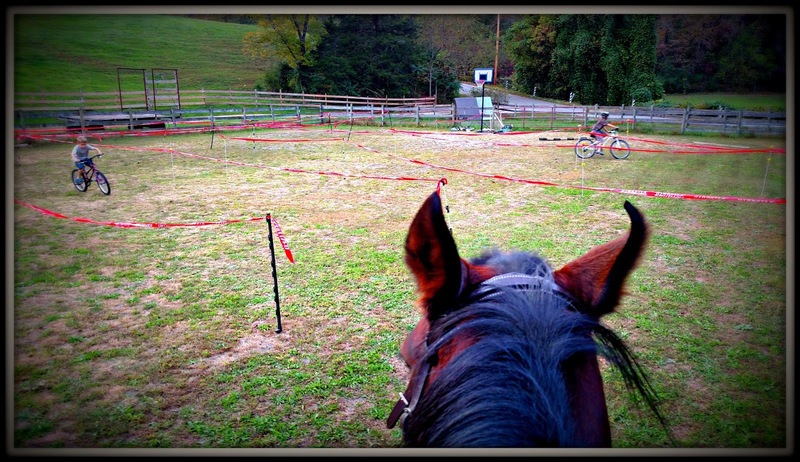 Reminded me of my youth, flying around tight jumper courses on ponies, but without the jumps. Here we are after, exhilarated from our playful ride. She still has those funny curled ears, but look - she's got one ear on Pierce, who took the picture, but one ear on me. We're really feeling connected lately. I'm looking forward to more fun fall rides. ...fun on wheels and hooves. Wonderful! You do such good work with Francie! Oh how neat... I love that last picture of you and Francie.... Are the boys interested in learning how to ride her also sometime? Right now, It looks like they were having fun on that special maze with their bikes.... Neat. You really ARE the Horse Whisperer! Did you ever take courses on taming horses? And you are so patient and gentle. To take a horse from being scared of something to loving it is like magic to me. Paul did a great job making the maze course. 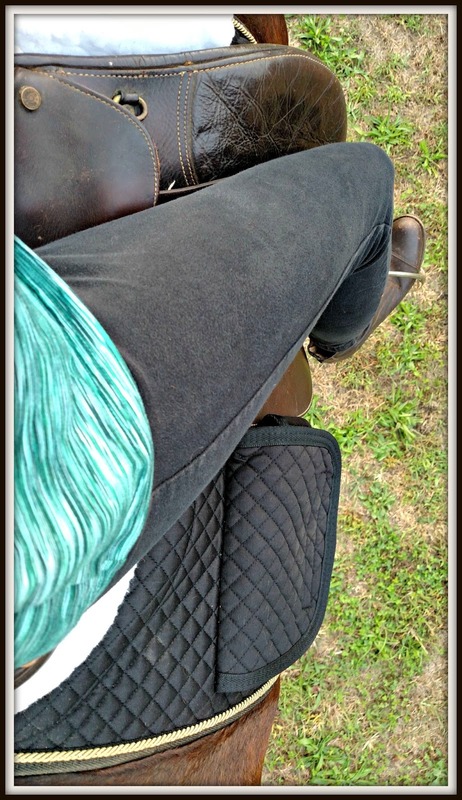 Those saddle pockets are pretty, and are like a purse for the horse! I LOVE her cute curled ears. She is one of a kind, and the ears are hers, and hers alone. How wonderful, great photos and it's wonderful for children to grow up with as many animals as possible! Hooray for Francie! She has come a long way. Wow! She has certainly grown in so many ways! Good work! It's nice that you have each other. Did Bobby ever come home? I have been thinking about your kitty. I would love to have horses, but we're too old and creaky!!!! I enjoyed yours! You've done tremendous work with Francie, Lisa! What fun you and the boys had. I would have like to learnt to ride, but I never had the opportunity to do so..... in my next life perhaps. That's awesome that she had a fun time with the course. What a cool idea to create the course for the kids too! oh! Thank you for the update - I often wonder how Francie's story turned out. Your boys are so lucky that they get to grow up among these. Love all the pics. That's all wonderful news. I imagine the boys really had a fun time! This makes me miss my horse - and riding - so much! You've really worked so hard with that horse. Such a pretty animal! I love that you can have fun riding her now. So much fun for all of you! It looks like you had a great time with Francie while the kids were on bikes. You're so patient and wonderful with animals! I love the ears! Glad she's doing well and you're building a nice relationship with her. Oh!! Wow!! I love the picture of you with Francie, your beautiful horse. Your children are gorgeous, Lisa. You are a great mom.